Discover the magic of Ben Hogan’s ball striking. Sync Your Arms & Body for perfect rotational swing. 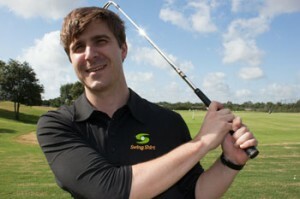 Top training device and a top quality golf shirt. The Swing is in the Shirt. Having grown up in the golf business, Fred Collins, the inventor of Swing Perfector, has had his time on the course. As a current PGA Master Teaching Professional and Life Member of the PGA, he has been teaching individuals on how to improve their swing for over 30 years. Formerly known as the “Swing Doctor,” Fred was the Director of Golf at Memorial Park Golf Course as well as Bear Creek Golf World where he worked closely with golf pros as well as clients to ensure quality from the start and finish of each lesson. Prior to his time as a director, Fred served as a golf teaching professional at Quaker Ridge Golf Club.